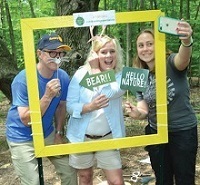 SAWYER — Through­out the month of July, Chikaming Open Lands (COL) and the Rotary Club of Harbor Country are organizing the #10Trail Challenge, a pro­gram designed to highlight local hiking trails in Michi­ana while offering food prizes for participating. At any time during July, participants in the #10Trail Challenge will hike any or all of the following 10 trails in the area: COL’s Robinson Woods Preserve, Jens Jensen Preserve, and Turtle Creek Preserve; Berrien County’s Galien River County Park and Love Creek Nature Center; Chikaming Town­ship Park and Preserve and Harbert Road Preserve; Southwest Michigan Land Conservancy’s Kesling Na­ture Preserve; the Village of Three Oaks’ Hoadley Nature Trail; and Shirley Heinze Land Trust’s Ambler Flatwoods Nature Preserve (in Michigan City). Along the trail in each of these natural areas, COL and Rotary will install pic­ture frame “selfie stations.” Participants are asked to take a photo of themselves at these stations, and tag COL on Instagram using #10trail and #chikamingo­penlands, and/or post the photo on Facebook tagging @chikamingopenlands. Those not using social media may email COL their photos at col@chikamin­gopenlands.org. COL will track the photo submissions throughout the month. Participants who hike any three to four trails will win a free cup of coffee (or other beverage of their choice) at Infusco Coffee Roasters in Sawyer. Those who hike any five to nine of the trails will re­ceive a sandwich of their choice at David’s Delicates­sen in New Buffalo. Partici­pants who hike all 10 trails will win a pizza from Patel­lie’s in Three Oaks. Photo submissions will be tallied and prizes awarded on Au­gust 1, 2018. Participants must reg­ister before beginning the #10Trail Challenge by filling out an online registration form, found on the web­site at www.chikamingopenlands.org/10trailchallenge. Registration is available now through the end of July. The #10Trail Challenge is the latest program in an on­going partnership between COL and the Rotary Club of Harbor Country. Along with providing funding to support the program, Rotary volunteers have assisted in the planning process and in building and installing the selfie stations. For the past two years, Rotary has also supported COL’s environmental edu­cation program for local elementary school children, the Mighty Acorns. Chikaming Open Lands is the local land conser­vancy dedicated to preserv­ing the open spaces and natural rural character of southwest Berrien County. COL works to protect and restore native plant and ani­mal habitat, improve water quality, and permanently preserve ecologically sig­nifi cant forests, prairies and wetlands, as well as prime farmland and other open spaces in this area. COL serves nine townships in southwest Berrien County, and has been instrumental in preserving 1,755 acres of open space since its found­ing in 1999.